Finally more or less up to date with the digests from my image a day Hull2017 UK City of Culture project – though you can see the new pictures every day and see them with my comments on my Facebook page – details at the end of this post. Here and for the next few pictures I have to apologise, for these are not pictures of Hull but of Goole, upstream and on the other side of the river, not on the Humber but on the Ouse, though at least in the East Riding. Goole is the UK’s most inland port, 50 miles from the sea and close to the industrial areas of Yorkshire with good canal links, as well as rail and now motorway connections. 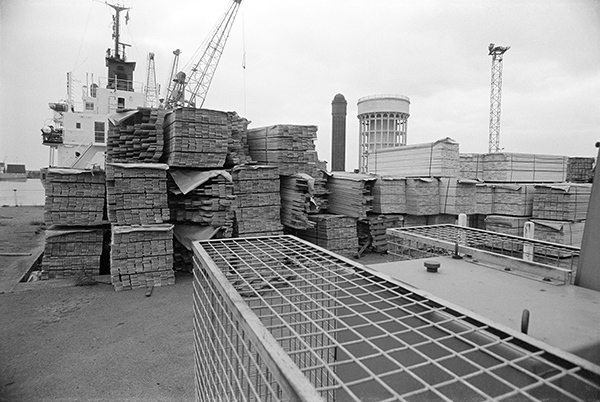 Timber, shown in this picture still comes into Goole, largely from Russia and the Baltic States, Finland, and Sweden, and is still handled here in West Dock. In the background at right we see Goole’s iconic (if anything at Goole can be iconic) landmarks, the listed ‘salt and pepper pots’, both water towers, and this view is from Lower Bridge St and the ship is in West Dock. 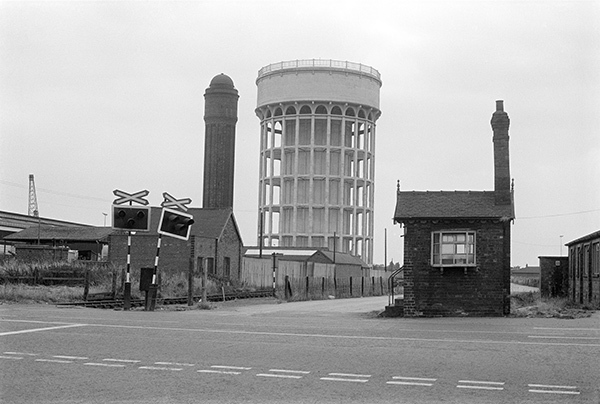 The two water towers are still a notable landmark for some miles around, and the buildings to the left of the railway line still stand, but there is now no level crossing and the buildings at the right have gone. Both water towers are grade II listed. The more slender brick tower dates from 1885 and is approximately 43 metres high and 10 metres in diameter. It is no longer in use. It was replaced by its fatter neighbour, diameter 27.5m, height 44m, completed in 1927 with a capacity of 750,000 gallons. It was claimed to be the largest structure of its type in Europe when built for Goole Urban District Council. 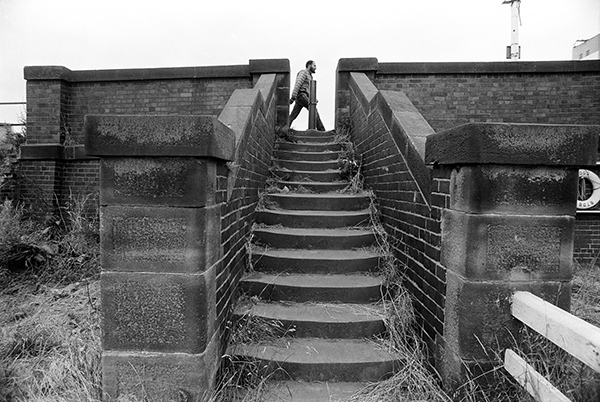 I think these steps were up to Bridge St from the dock side, and that they are now closed to the public. But Goole has changed considerably since I was there. I think the only map I will have had would have been a 1:50,000 OS map, borrowed from my local library, which at that time showed no rights of way and of course had no street names. So I simply followed what seemed an obvious route and was fortunate it took me to a footpath around the docks. Things are rather easier now – Goole even has an online electronic interactive town guide and a conservation area guide, as well as the Yorkshire Waterways Museum and an art trail. My mother-in-law in Hull thought I was mad to visit Goole back then, but then she thought I was mad to photograph the parts of Hull I did. 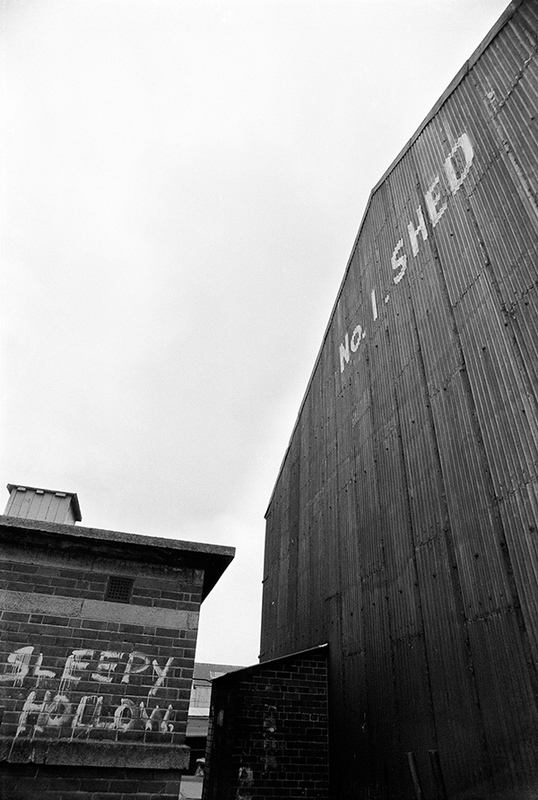 No 1 shed was built in 1933 next to Barge Dock, Goole. Quite why someone has painted ‘Sleepy Hollow’, well before the film or TV series I don’t know, though it was probably a good description of the place. The Legend of Sleepy Hollow was a short story by Washington Irving, first published in 1820 (though his Rip Van Winkle was more popular.) It’s a story including a headless horseman set in a Dutch settlement (perhaps there is some connection with the Dutch River just a few yards away) in New York State who is possibly one of the two male contestants for the hand of Katrina Van Tassel, riding with a pumpkin for a head on his saddle, and is popular at Halloween. There were a couple of US TV adaptions of the story in 1970 and 1980 but I doubt if they made it to Goole and the story wasn’t popular outside the USA. There appears to be some lettering on the bow of the barge in the foreground, but I cannot make it out. Behind it are ‘Alison’ and ‘Claire’ both Goole barges. 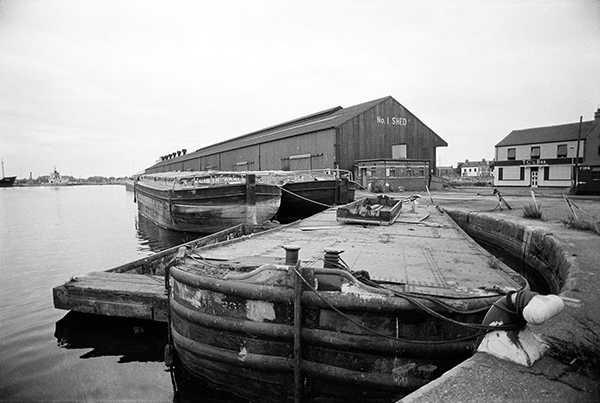 Barge Dock was one of the original docks when the port as opened in 1826 and is now connected to the River Ouse by Ocean Lock, built 1938 and the largest in the docks. The pub on South St, here T.C.’s Bar, is still standing and one of very few pubs on the docks still open as The Middlehouse. Back in 1626 by King Charles I of England employed Sir Cornelius Vermuyden to drain one of his favourite hunting grounds, Hatfield Chase, as he was fed up with his horses getting stuck in the mud. 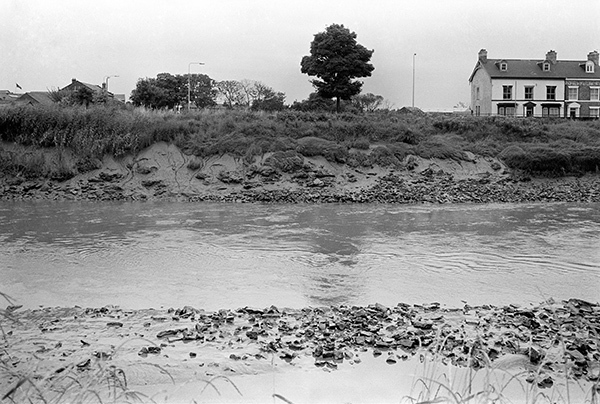 The River Don flowed through and too often over the area, and at first this was diverted to flow into the RIver Aire rather than the Trent. But this still flooded and a new channel, the Dutch River was dug to take the river into the Ouse at Goole and was completed in 1635. It wasn’t dug for navigation, but was used by boats despite various problems with shoals, bridges and low water at some tides. But since 1905 when the New Junction Canal from Stainforth to the Aire and Calder Navigation west of Goole was opened has almost entirely been a drainage channel. The building of the Dutch River marked the start of Goole, but it was the arrival of the Aire and Calder Navigation in 1826 that really began the town as it is today, with its major trade being the export of coal from the West Riding to the continent. With the opening of railways – the Wakefield, Pontefract and Goole Railway in 1848 (later Lancashire and Yorkshire) connecting Goole with the West Riding and rather later in 1870 the Doncaster to Hull line of the NER – the port really took off. The port remained busy until the end of much of Yorkshire’s industry and coal mining at the end of the 1970s, and was at a fairly low ebb in the 1980s when I took these pictures. The terrace of houses is still there on the Swinefleet Road. A few more pictures from Goole in a week or two. The block of concrete is still there at the end of Ann Watson St, along with three of the wooden posts but little of the rest of the scene remains. 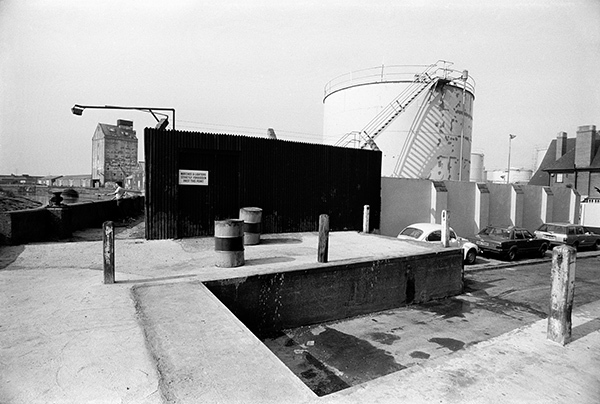 At extreme right is the back of The Ship pub, and though the closer storage tanks have gone there are still some in the middle distance – and possibly some of the same distant riverside sheds. This is close to where the ferry from which Stoneferry got its name used to cross the River Hull. The current pub dates from 1932, but it replaced an earlier ‘Ship Inn’ on the riverbank probably since the 17th century. Not a lot is known about the life of Mrs Ann Watson, the widow of Reverend Abraham Watson but her will in 1720 left a legacy to provide her house in Stoneferry to provide accommodation and relief to widows or unmarried daughters of Church of England Clergymen and to to provide a school for poor girls as well as a grant of £5 towards the maintenance of any scholar of Halsham School in Holderness to go to Oxford University, all from the income from her farm lands, houses and tenements. These were obviously extensive, and included five fields to the north of Holderness Road which were sold to the Hull Urban Sanitary Authority for £16,909.7s.6d in 1884 to form part of East Park and also land sold for the track of the Hull to Hornsea Railway. Ann Watson’s Charity continues to this day to provide accommodation and relief in need for poor women who are members of the Church of England, with preference being given to such persons who are widows or unmarried daughters of clergymen of the Church of England and to promote the education of persons under the age of 25 who are residents of or attend schools in the East Riding of Yorkshire. In 1907 Hospital Lane in Hull where Ann Watson’s alms house formerly stood was renamed Ann Watson Street. To the north of Ann Watson St was HOMCO (the Hull Oil Manufacturing Co., Ltd.) founded in 1888 was one of the first uses of solvent extraction for oil seed processing. They were an early processor of castor oil and a soap manufacturer and were acquired by BOCM in 1922 and closed in 1953. The sign on the fence says ‘Matches & Lighters Strictly forbidden past this point, so the site here was presumably storing highly flammable materials. This site is now occupied by the Regroup (UK) Ltd oil waste disposal and re-cycling. To the north-west was a paint works, Hangers Paints, with its entrance in West Carr Lane, which I think is probably the tall building on the riverbank. Behind me as I took the picture was the site of the General Extracting Co., opened in 1896 and bought up in 1904 by Joseph Rank. It became the Premier Oil Extracting Mills Ltd. and in 1919 was amalgamated into Premier Oil and Cake Mills Ltd and closed around 1971. There was a short branch railway line to the mill from Stoneferry Goods Station across Stoneferry Road, which was a branch from the Hull to Hornsea line. The mill is long gone and the site now occupied by B&Q. South of Stoneferry Bridge is the Isis Mill, a Grade II listed building still standing (and mentioned in earlier posts.) 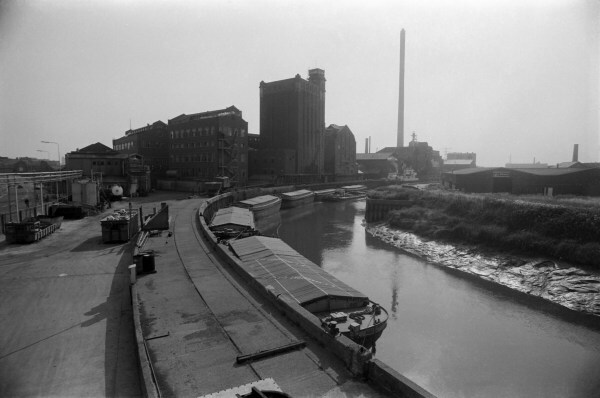 The string of six barges gives an indication of the importance of the River Hull for transport, and beyond them a larger vessel (its name unfortunately not legible) is moored at the wharf, either at Croda’s Isis Mill or just past it at Reckitt’s ultramarine factory with its tall chimney in Morley St. The silo and the buildings to its left are still there, but beyond it only the now unused chimney still stands. The sheds across the river with a Michelin advert on them also remain in what is now called Innovation Drive. You can see the new pictures added each day at Hull Photos, and I post them with the short comments above on Facebook. Comments and corrections to captions are welcome here or on Facebook. This entry was posted on Wednesday, July 19th, 2017 at 08:46 am and is filed under Hull Photos, My Own Work. You can follow any responses to this entry through the RSS 2.0 feed. You can leave a response, or trackback from your own site. Sleepy Hollow (9th July) was I find the name given by sailors to the port of Goole – at least according to Arthur Mee in his series ‘The Kings England’ published in 1947. Thanks to a very informative web site, Goole on the Web: http://www.goole-on-the-web.org.uk for that information.